This makes a great Back Up or Rock Light! These white LED lights are nearly flush and a clean design! Hi gloss multi faceted lenses throw a nice flood of light. Flush mount design will not get bashed on the trail. 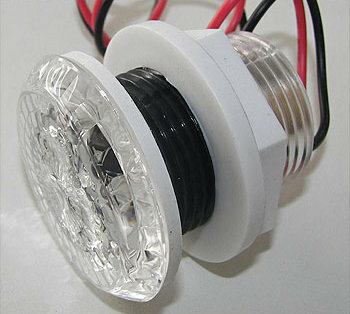 Each LED lamp has 3 high power LED's (about 200 lumens). Simple to wire and very low amperage draw. Cutting a 1-1/4" diameter hole to mount these LED lights. Crimp connectors or soldering iron to re-connect wires to stock harness. Additional lights are required (head, tail, side marker & license plate lights) to be street legal.